After spending the first day or so in the French Quarter, we had the opportunity to walk around the Garden District on Saturday. We could not have asked for better weather while passing by all the historic mansions on our way to lunch. We had made reservations at Coquette after reading such glowing reviews about the restaurant both on the Interwebs (I diligently do my research, as you can tell). 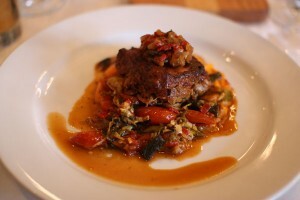 They also featured a prix fixe lunch menu which included three courses for $20. The drink list reminded me of something you would see at PS 7’s or The Passenger as Coquette is well renowned for its excellent cocktails. 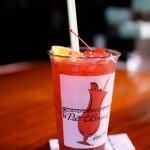 I ordered the Coquette Collins which featured bourbon, Pimm’s, Cherry Herring, lemon, and soda. It was so clean and refreshing given how warm it was outside. Rachel went for the traditional Bloody Mary which was made with house-infused black pepper vodka. She remarked how it was one of the best she has ever had, and after I had a sip, I could not agree more, and I don’t even like Bloody Marys! I started the meal off with the Burrata appetizer. 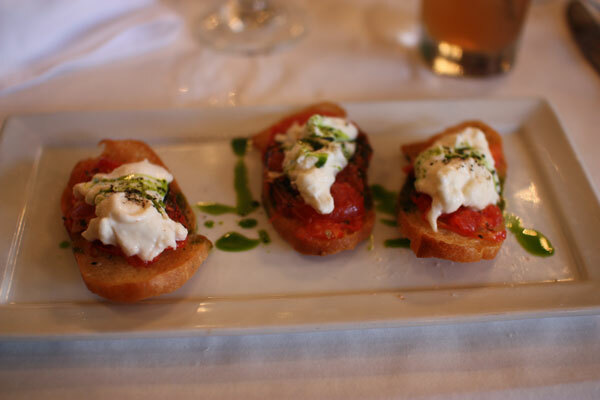 Severed atop pieces of crostini and layered with roasted tomatoes, the burrata and its creamy texture really worked well with the rest of the ingredients. The cheese had a mild flavor, which was perfectly fine with me as I am not the biggest fan of strong cheeses, while the tomatoes were simply savory. It was quite the enjoyable first course. For the entrée, I opted for the Cochon de Lait, another one of New Orleans’ specialties. After tasting the first bite, I could see why. 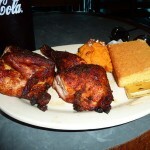 The dish’s main component is the suckling pig that is marinated and then pit-roasted. The presentation made it appear like a variation of pulled pork, but regardless of how it looked, it was simply fantastic. Accompanied with pepperonata, fingerling potatoes, and pork jus, the tenderness of the pork combined with the well thought-out seasonings made this one of my favorite dishes of the entire trip. Rachel ordered the drum fish since, after hearing about it at NOLA the night before, she wanted to try a local, regional fish. The filet was served over a mushroom broth with some pieces of smoked ham and leeks. Much to her delight, it was moist and not too heavy for a lunch meal. As for dessert, I ordered the beignets with chocolate coffee pot de crème. 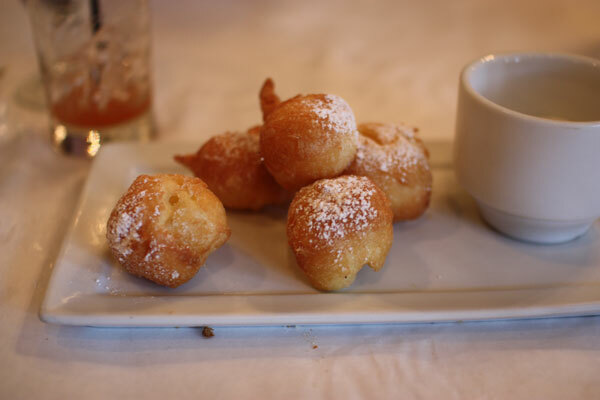 The beignets were light and fluffy, but the pot de crème might have stolen the spotlight from its fried counterparts. Between being not too heavy and possessing such a fresh, potent chocolate flavor, this item could have been served by itself. Not that the beignets weren’t bad, but I preferred the ones we had the night before at Café du Monde instead. 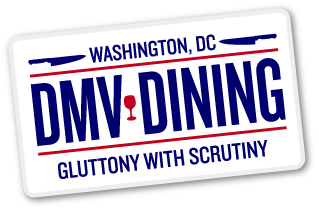 Dinner, on the other hand, would be much more casual that night. As stated before, I am a big Maryland fan, and since they were playing Florida State in a rather important matchup, I wanted to find a decent place to watch it as well as enjoy some good Louisianan bar fare. I recalled walking past a place called Tracey’s in the Garden District when we were heading over to Coquette earlier in the day, and the place was jam-packed with LSU fans who were watching the Tigers take on Ole Miss. Turns out that it is a rather popular sports bar (used to be named Parasol’s), and since it appeared like more of a local hangout as opposed to tourist central on Bourbon Street, it was right down our alley. First off, I was in love with their beer selection. Three dollars for Abita bottles? That alone won me over. The restaurant didn’t really have waiter service per se, but instead you just went up to the kitchen and ordered your food off of the blackboard menu hanging on the wall. While I was scrolling through my list of options, there I saw it: roast beef po-boy. Rachel and I split a sandwich knowing it would be huge as well as ordered a side of gravy fries, because, well, they’re gravy fries. We had no idea, however, how good the roast beef po-boy would actually be. Now, I despise mayonnaise on my sandwiches, burgers, you name it. I didn’t realize the po-boy came with mayo, but you know what, it was pretty frickin good. I think that can be attributed to how the hot roast beef au jus, gravy, and mayo combined together inside the po-boy and created a sauce I can only describe as purely delicious. The bread played a crucial element as well as it held up rather well despite the greasy, appetizing mess that was stuffed inside. Observing the fresh loaves stacked in the back of the kitchen further emphasized why the sandwich was on such a level of greatness. As for the gravy fries? 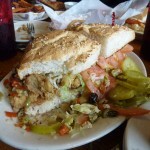 They went hand in hand with the po-boy. 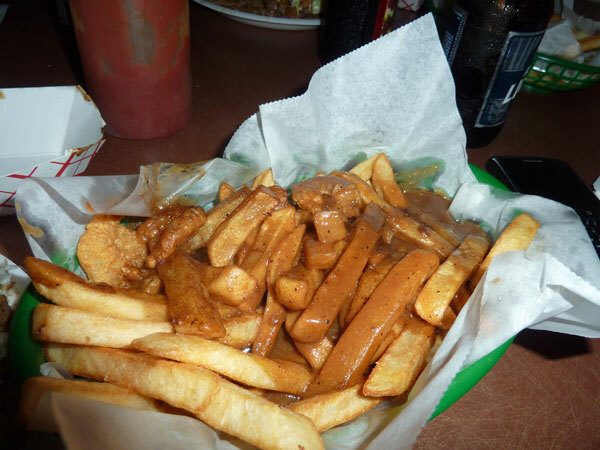 Freshly fried and topped with the same gravy found in the sandwich, you could not ask for a better dinner at a reasonable price. 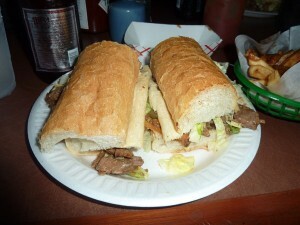 A day later, I found out that Gourmet Magazine had named Tracey’s roast beef po-boy the best roast beef sandwich, ever. And we had gone there on a whim! I love it when stuff like that happens. Oh, and the publication was absolutely right by the way.